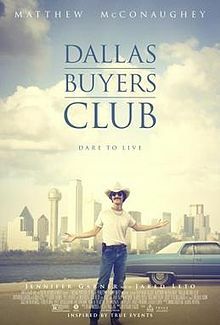 Indianapolis, Indiana – A copyright attorney for Dallas Buyers Club, LLC of The Woodlands, Texas sued in the Southern District of Indiana alleging that 24 Doe defendants infringed the copyright of the motion picture “Dallas Buyers Club,” which has been registered with the U.S. Copyright Office. The movie in question, Dallas Buyers Club, stars Matthew McConaughey as an AIDS patient who smuggled unapproved AIDS-treatment drugs into the United States during the 1980s for his own use and to distribute to others afflicted with AIDS. The movie was nominated for six Academy Awards and won three. Matthew McConaughey and Jared Leto also won Oscars for Best Actor and Best Supporting Actor, respectively, for their performances in the movie. In this Indiana copyright infringement lawsuit, filed by a copyright lawyer for Dallas Buyers Club, LLC, plaintiff asserts that the copyrighted movie was infringed by 24 as-yet unnamed individuals, who were sued as “Doe” defendants. It alleges that this copyright infringement took place using the “BitTorrent protocol,” which is different from the standard peer-to-peer protocol. Specifically, the BitTorrent protocol enables numerous computers, even those with low bandwidth, to exchange pieces of a computer file among themselves. Each computer that has downloaded a particular piece of a file then becomes a source from which other computers may then download that piece of the file. As a result, the entirety of a computer file may be disseminated across the Internet quickly without having to rely on a central source from which to download. Plaintiff contends that the 24 defendants acted as part of a “collective enterprise” to infringe its work and that the acts constituting the infringement were “willful, intentional, and in disregard of and with indifference” to plaintiff’s intellectual property rights. • for attorneys’ fees, litigation expenses, including fees and costs of expert witnesses, and other costs of this action. Practice Tip: Defendants who fail to appear run a significant risk of having a default judgment entered against them. There is a significant disparity in the dollar amount awarded in default judgments against defendants in copyright infringement cases involving BitTorrent. In two separate cases, Judge William T. Lawrence ordered defendants who failed to appear to pay $20,000 for the copyright infringement that was deemed to have been admitted by the defendants’ failure to defend against the allegations. See here and here. However, in a similar case, Judge Jane Magnus-Stinson ordered an entry of default judgment against a defendant for $151,425, the full amount requested. Overhauser Law Offices, the publisher of this website, has represented several hundred persons and businesses regarding copyright infringement and similar matters. The suit was filed by Keith A. Vogt of Takiguchi & Vogt, LLP. The case was assigned to District Judge William T. Lawrence and Magistrate Judge Mark J. Dinsmore in the Southern District of Indiana and assigned Case No. 1:14-cv-01145-WTL-MJD.